Flying against heavy clouds of the dawn these ATC Douglas C-47 left Natal outbound to Africa and Far East. Within minutes they will be alone in the vast expanses of the south Atlantic. The main objective of that busy airbase consisted in providing an appropriate flow to the war supply. All sort of items ranging from aircraft engines to plasma sanguine and explosive fuzes, are on the top of the list at the huge storage facilities maintained at Natal by the greatest cargo service in the world the ATC. This job was a joint cooperation undertaken by US Army which administered the base and the Brazilian government. Besides that, the primary goal of those 6,000 men who served in the base was to provide an adequate maintenance of hundreds of aircrafts so that they could be ready for departure as well as their crews with duly training with combat flighting technics. Natal became the crossroads of the world. It has been visited by dignitaries as the Pres. Roosevelt, Prime Minister Winston Churchill, Madame Chiang Kai-shek, Wendell Wilkie, Generals Claire Lee Chennault, the legendary Commander of the heroic Flying Tigers, Joseph Stilwell, Capt. Eddie Rickenbacker, and a variety of movie stars, artists like Clark Gable, Ava Gardner, Bing Crosby, Glen Miller orchestra, Humphrey Bogart, Orson Wells and diplomats. In the photo, men are awakened at dawn by Alarm chief of the base to take their breakfast before they leave. Meanwhile out there still in the dark planes are supplied as necessary for the long journey that will open this day. Blackjack is a common game among American airmen who have some money but not enough to reverse losses. Silk stockings are offered by a small but persuasive clerk at Natal to US officials, who do not cease to worry about taking one for sisters or girlfriends. Short leather boots made in Brazil are very appreciated by American airmen when during their stay at Natal. They are a genuine copy of boots made in Texas, and protect both in the desert and in the jungle, being also very comfortable and stylish for use in service and socially. American aviators seen doing shopping at the Markets in Natal. 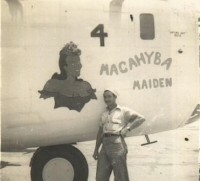 American pilots are are seen initialing money from several countries. Some have several bundles of notes from those countries who have visited recently. Many of them cut them into strips sending them to clubs that specialize in this new kind of hobby. Swiss watches are very cheap at Natal. Airmen look for the same for themselves as well as for gifting. Brazilian retailers like to meet Americans who buy everything. The native Bars and Night Clubs bars already have on their menus drinks made in the USA and the waiters fill the pockets with abundant tips. In this piece of Brazilian handicraft called "Rede" armed conveniently under the wing of an aircraft, this aviator take a nap. They call it "Horizontal Engineering" .Tomorrow he may already be in Africa or bound for a distant front of war. This engine with 1,600 HP, air-cooled is properly packaged in a C 46. 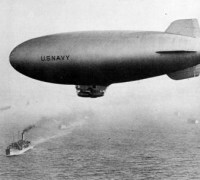 Aircraft like this can carry several of these engines in a double row along with crates containing military cargo and passengers. Aside from the sending material to the fronts, Natal airbase also gets damaged engines for maintenance inspection and return to the front. In Natal, the plane with passengers is sprayed with insecticide just before boarding for Africa. This service against Malaria is supplied through DNSP. A container with blood plasma is conveniently tied before departure of the plane. Many drugs are shipped this way to all fronts of war. Mica and quartz extracted from the Brazilian deposits are loade in a RAF bomber converted into cargo transport. This valuable mineral is used in radio equipment manufacturing. A newly arrived pilot fills out a form reporting the details of his flight. 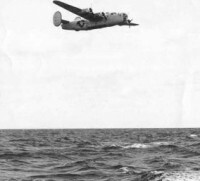 Still equipped with his lifesaving required for a landing at sea. The use of radio transmitter and rubber dinghy is explained by a medical officer to the crew shortly before departure. 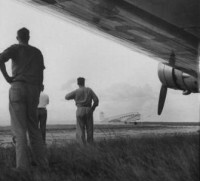 Along with the poster warning that should the crew to remain clean-shaven and do the military salute, a crew member is seen doing their planning before a flight. Vice Adm. Jonas Ingram, Commander in Chief of the Fourth Fleet based at Recife is seen being welcomed by high ranking Brazilian officers when arriving at Natal for an inspection. US ambassador Phillips sent in a mission to India, arrives at Natal is seen welcomed by Col. Griffin as part of the cremonial duties of this staff officer. Pictures by Revista do Globo Brazil.